I was asked what I was going to cook to celebrate the return of my erstwhile taste buds’ and the winning of a copy of Julie and Julia. I have to very shamefacedly admit that the first meal I cooked where I could taste every nuance … was instant noodles. After the murtabak of the previous day, I was too sated to eat a proper dinner. Now, most people would be able to consume a medium-sized murtabak in one sitting. I managed to eat the murtabak over three meals – dinner, breakfast and lunch. 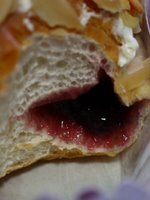 My prodigiously small appetite allowed the inclusion of a fairly large strawberry pastry in between breakfast and lunch but come dinner, a heavy meal was the last thing I wanted. Also, I was disinclined to cook with my housemate entertaining his soccer buddies in the house. Does football season ever end? So it was instant noodles for me. 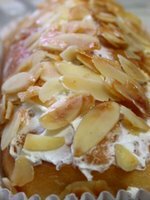 Fast, easy and terribly unhealthy but an absolute boon when I am in a rush. Now, normally, I disdain and sneer at the Maggie noodles. The synthetic taste of plastic rests uneasily on my taste buds and sits even worse in my stomach. Biting into a strand of the curly noodles imbues my mouth with the taste of the rubber conveyer belt from where they were spawned. I'm not keen on eating rubber. And too often the little sachets of seasoning have so much MSG that I am a parched cavern craving moisture for days. However, I discovered the A1 instant noodles a while back when a colleague offered one up when we were working overtime. These were bak kut teh flavoured ones which I had never seen before. 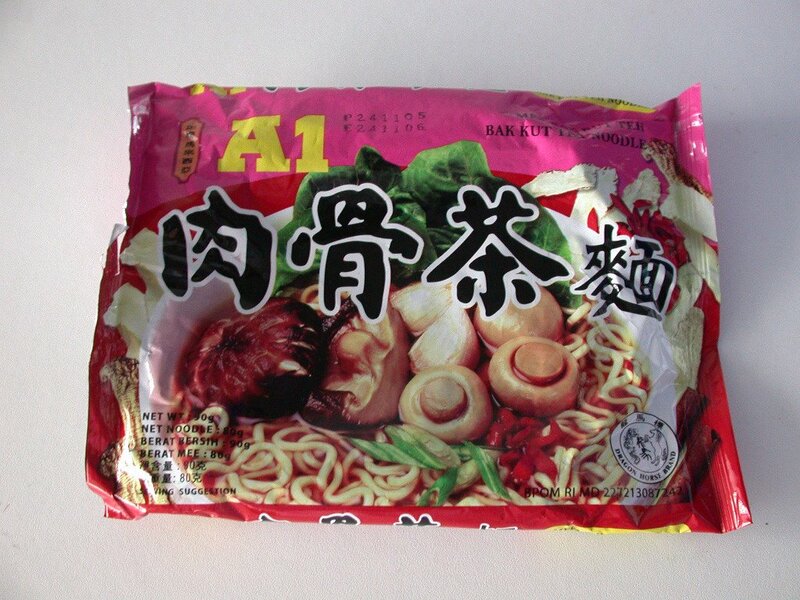 Bak kut teh instant noodles … how ingenius! I kneel at the altar of bak kut teh as I think it is one of the most delectable dishes ever invented. A tea soup of stupendous flavours concocted from garlic, spices, peppercorns and pork ribs, I could eat this every day. It truly is the most comforting, aromatic and heart-warming soup ever. Pairing it with noodles was something out of my ken yet it struck a familiar chord. At first, I was very sceptical. I was sure that the bak kut teh flavouring would taste as synthetic as the chicken or seafood flavours. But to my surprise, it was actually quite aromatic. 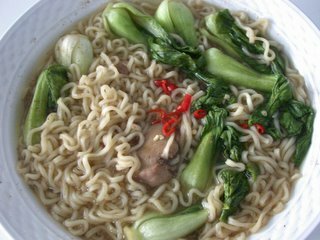 Perhaps the strong herbs masked the usual taste of chemical subterfuge written in the DNA of instant noodles but it sure tasted good to me. I began stocking the bak kut teh flavoured instant noodles as emergency rations when I am unable to cook or am pressed for time. Yesterday was one such day. Of course, tearing up the silver foils and sprinkling the toxic contents was not enough for me. I had to mess with it. I added a chicken liver and about 8 bunches of baby bak choy in a vain attempt to healthify the dish. I also threw in additional ground black pepper with impunity and pretty much zapped the whole thing in the microwave. Having my taste buds back meant that I wanted to numb it again … with spice. So I sliced a chilli padi and sprinkled that on top of the noodles. I know it’s unhealthy and positively criminal for a foodie to be consuming instant noodles. And I am sure many will sneer and jeer at me (as if they don't already). But you know what? It tasted good even though I suffered terribly from MSG reaction and still had a raging thirst hours after eating it. So, there’s my shameful confession. I not only cooked instant noodles in the microwave, I ate them. And liked it. Are you going to revoke my food blogger card now? I think your food blogger card can safely stay put. I eat plenty of Kraft Macaroni and Cheese (Kraft Dinner), which is just as shameful (but oh so good!). Whew, Kalyn, that's a relief. You like me, you really like me?? Awwww ... hey, I've been known to eat at Mickey D's when desperate too. Marilyn - Welcome! Never tried Kraft Macaroni & Cheese but in Germany, there were these little pots of macaroni & cheese that I was addidcted to. So I can understand the attraction. Ces - I prefer the mushroom swiss myself! I CONFESS... I also crave for packet noodles... They're called Pancit Canton. It's a Filipino noodles. I have these stashed in the cupboard - for emergency. Like the other night when i finished late from work and it was too late to cook. 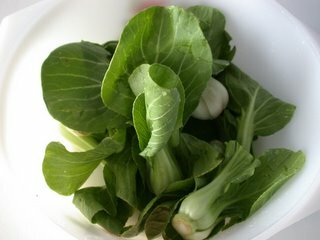 Great idea to add pak choi and chicken liver - will try this soon - as i can get hold of chicken liver here. Mae, never heard of Pancit Canton. Sounds intriguing ... I shall ask the lady who helps me clean the house. She keeps promising to teach me some Filipino dishes but we never have time! Actually, I learnt how to "augment" instant noodles when I was in Hong Kong. They eat instant noodles all the time there but they add these mad stuff to it. Very bizarre but it kind of makes sense too, ya know? But hey, I love instant noodles! Perked up with prawns, chilli and lime juice, instant noodles can be very good.